Winix Dehumidifiers are much less well known than brands from US companies such as Frigidaire and Danby. They are also less widely used than other models from non US companies such as Haier and LG. This apparent lack of popularity is probably due to the higher prices generally charged for Winix models. In reviews of the Winix brand, however, we find that customer satisfaction is high and user experiences bear out claims that Winix models show a higher overall build quality than some of their competitors.They are also compact and stylish, fitting well into today's modern homes. Earlier Winix models incorporated an integral condensate pump which was useful for users who did not have a convenient floor level drain into which to allow the condensate to drain continuously via a simple gravity feed. This feature has been deleted from the current two model range. It is only possible to speculate on the reasons for this change but it is noticeable that The current range is now more competitively priced than and this may have been achieved by saving the cost iof installing the pump. We have a high regard for Winix Dehumidifiers and recommend them confidently to our visitors. The next section tells you a little more about the company behind them. 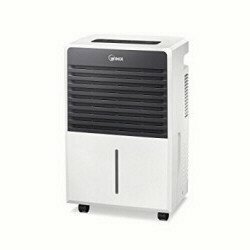 Winix dehumidifiers are manufactured by Winix Inc. a company based in the Republic of Korea (South Korea). Winix produces a range of home appliances with the common themes of air and water. These products include air coolers, air cleaners and air purifiers, cold and hot water purifiers, water dispensers, fan heaters, components for air conditioning units, evaporators, condensers, bidets and other related items. The company is also a supplier of materials to other manufacturers and processors, including resins and fuses. 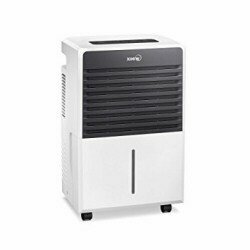 Winix manufactures dehumidifiers under private label brands for suppliers such as Sears (Kenmore) and also under its own Winix brand name. The Winix 50 Pint Model 50BT is a stylish unit that will remove excessive moisture and keep humidity at a comfortable and safe level in areas of up to 800 square feet. This unit may be used in a medium sized basement but is also suitable for other areas of your home such as living rooms, bedrooms and laundry rooms. User reviews of the Winix 50BT are largely positive. The unit is reported to be "effective" and "quiet" and many people select this model because it is one in which the fan does not run continuously. The Winix 50BT is a good all round performer with a host of useful features and I am pleased to recommend this model to our visitors. The Winix 70 Pint 70BT is a more powerful unit and will be of most interest to those who need to control relative humidity in a larger basement. The extra water removal power enables this unit to operate effectively across a larger area and the Winix 70BT will comfortably manage humidity in a space of up to 1200 square feet. Reviews of this model are not as plentiful as for some of the better known brands but the general view is that the Winix 70BT is well made, effective and easy to use. There are few complaints. There are other 70 pint models that are as good as the Winix 70BT and you should pick by features or price to suit your need but the 70BT is as good a choice as the best alternatives and we have no hesitation in recommending it to you. These links will take you to pages on which discontinued Winix models were reviewed. They are here for your information only.